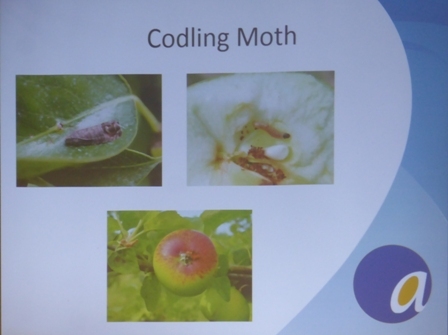 At a seminar organised by Agrovista, control of Codling Moth using environmentally friendly methods took centre stage. 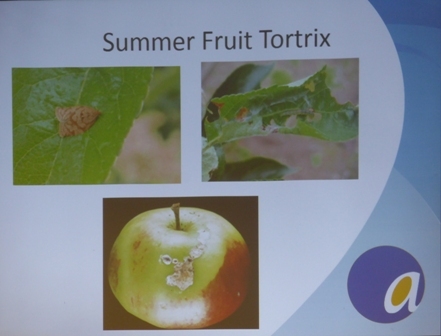 Professional fruit growers will be fully aware of the damage Codling and Tortrix Moth larvae can do 'uncontrolled' in an orchard; amateur growers in gardens will recognise the effect from an invasion of these 'little devils' but may not be aware of the life cycle and timing of controls available to a grower. These have traditionally been by targeting the Codling & Tortrix with an insecticide, which in the past few decades has been more efficient with the use of moth traps to monitor the presence of the moths assisting the timing of specific insecticides; the use of specific rather than 'broad spectrum' insecticides helps protect the beneficial insects living within the orchard environment. 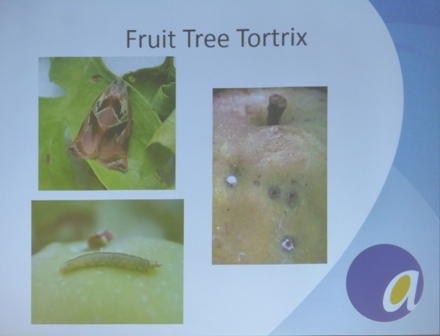 On Thursday of this week, The English Apple Man joined growers and agronomists at The Mercure Hotel at Brands Hatch in Kent for a two hour seminar organised by AGROVISTA > featuring a new pheromone mating disruption method for the control of codling and tortrix moths in apples and pears. 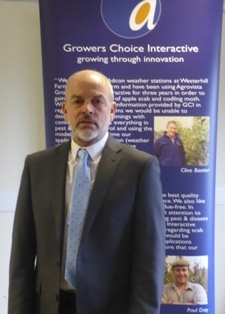 Introduction by Paul Bennett - Head of Fruit - Technical - Agrovista UK who told the audience this new introduction will revolutionise moth control in apple and pear orchards in the UK bringing the prospect of lower pesticide inputs and a consequent reduction in pesticide residues. The prospect of season-long control of codling and tortrix moths (including the partial second generation of codling moth) can be controlled from a single installation. 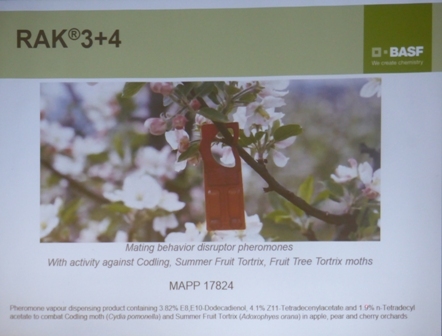 A presentation by Simon Townsend - Agronomy Manager for 'speciality products' @ BASF demonstrated the use of RAK 3+4 a dual pheromone disruptor - RAK 3 targets Codling moth and RAK 4 Tortrix moth. Both products are a 'Trademark' of BASF. 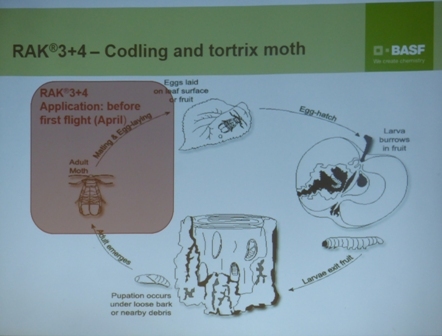 Simon Townsend reviewed the UK trials of RAK 3+4 and explained the RAK 3 is the pheromone for Codling Moth, while RAK 4 is the Tortrix pheromone. This pheromone lures male Codling & Tortrix moths, confuses their search for female moths and reduces the number of females capable of laying eggs. RAK 3+4 also lures other Tortrix moths, like Fruit Tree Tortrix, but does not lure all moths with potential for damaging fruit; for example Blastobasis sp - Spilonata sp and Epiphyas sp. species of pest which if present to the point of causing damage, can only be controlled with a specific insecticide. 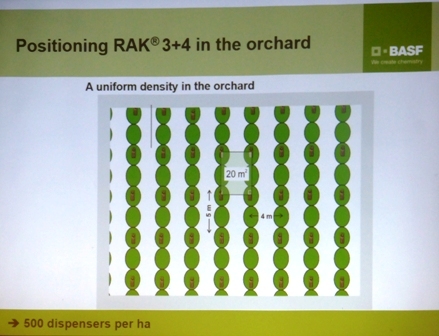 By using RAK 3+4 growers can cover all the 'summer risk periods' from 'first flight' to late infestations. 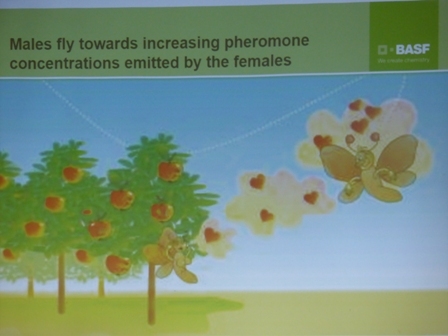 The pheromones are manufactured to be effective lures for 9 months. 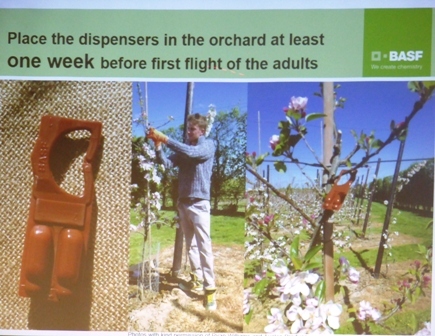 Growers need to place them in the orchards at least one week before the first flights of the target moths; e.g. Codling/Tortrix....at a rate of 500 units per hectare (1 per 20m square)...the position should be in the top third of the tree and clear of any leaves...hanging on wires is ok as long as the lure cannot spin in any wind and fall off onto the ground. Below: left; the dispensers need to be evenly placed across the orchard to ensure efficacy - and - right; pheromone release! Monitoring is always an important aspect of IPM and in the chart below, the profile of Codling Moth females is identified. In the top chart, (not easy to see clearly) the total larvae is shown in 'red/brown' while the newly born larvae can be seen in black. At the bottom; the 'old females' are shown in a grey colour, while the 'mated females' can bee seen as a 'dark bluish colour and the 'virgin females' in a light blue/grey colour. Codling pupate in the spring and adults begin emerging sometime in April, about the time apple trees are in bloom. The adults mate and the females lay eggs at sunset when the temperature reaches 65 F or higher for two or more days. The eggs, about 75 to 100 per female, are laid singly on leaves and branches. The eggs hatch in 5 to 12 days, depending on the temperature. Newly hatched larvae crawl to the fruit and tunnel in at the blossom end. Larvae feed inside the fruit until maturity, generally 2 to 4 weeks. Mature larvae emerge from the fruit and pupate in protected places. New adults emerge in 8 to 20 days, beginning sometime in June. A second generation of larvae feeds in July and second generation moths emerge in August. A small third generation of larvae feeds in September. Some of the second generation and all of the third generation larvae overwinter. Following Simon's presentation; 'the inevitable question' from the audience; "how much does it cost? 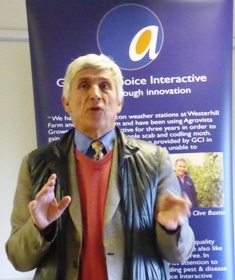 Simon said it will be about the same as using insecticides, but with advantages for the environment! 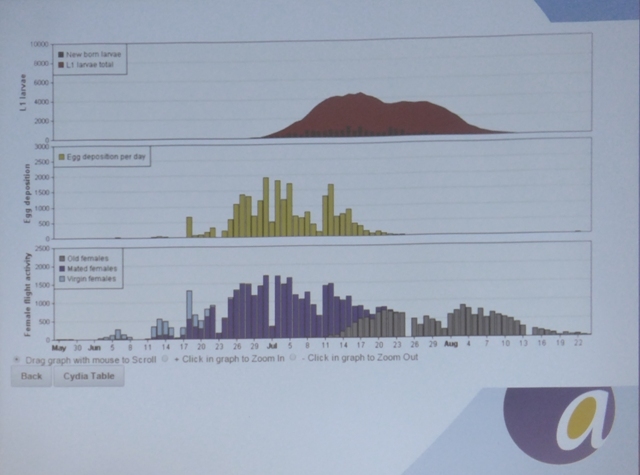 Paul Bennett said he had costed out the price as circa £250 a hectare based on probable insecticide use across a season. What about placing the dispensers? - It takes 2 'people hours' per hectare! 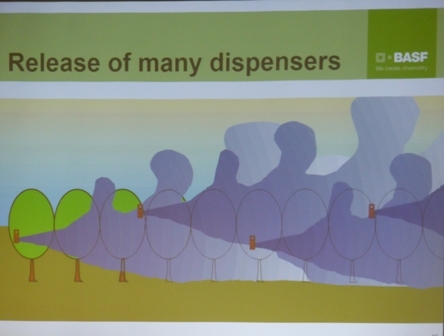 Some concern from growers present that placing dispensers on a large acre (100 hectares?) would require a lot of 'people' and would we have enough time/people to fulfill task? - Simon Townsend said it is perfectly acceptable to start placing dispensers early in the spring time! Guidance from BASF is to treat a minimum of 1 hectare and preferably at least 4 hectares with RAK 3+4. 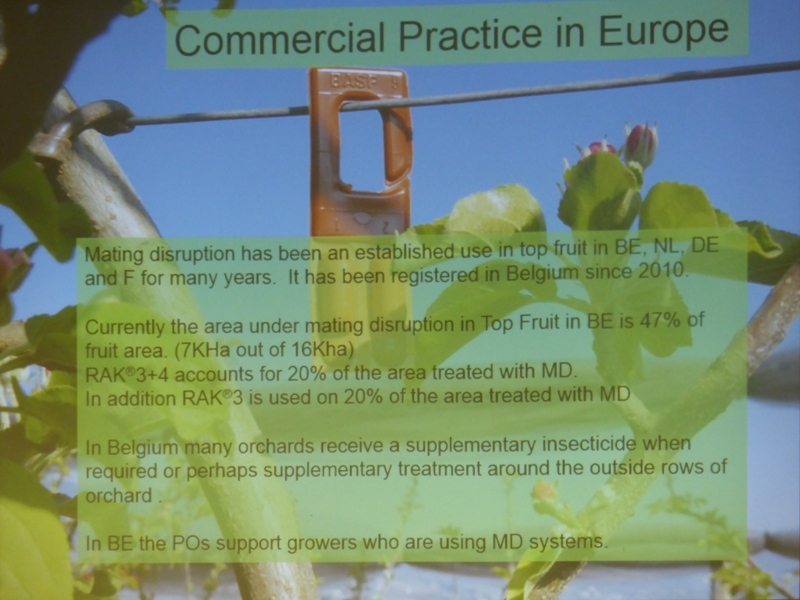 To date, use of RAK 3+4 has been used only on trials sites in the UK, but as an example, it is used widely in Holland, Germany, France and Belgium where 'mating disruption' is much more widely used. In Belgium 'mating disruption' has been used commercially since 2010. 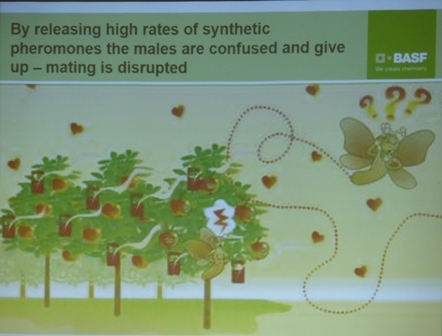 RAK 3+4 accounts for 20% of mating disruption in Belgium.